A quick post from me this morning asÂ I’m running off to the store, new stuff has arrived as well as the paint cans.Â Â Super exciting! I thought we should take a peak at some fabulous flooring ideas, but more specifically flooring ideas for hallways. Hallways are I reckon the most neglected room in the house, namely because they are such transitional areas. I decorate my hallway like I would my living room – with stuff in it so it feels pretty cool but I’ve never covered the stairs, until now. I have been searching through some pretty fabÂ flooring ideas for stairs and they all have a common link. They’ve all been designed by Kelly Wearstler. What I love aboutÂ Â Kelly’s choices is she doesn’t play it safe in hallways. Pretty darn cool hey. 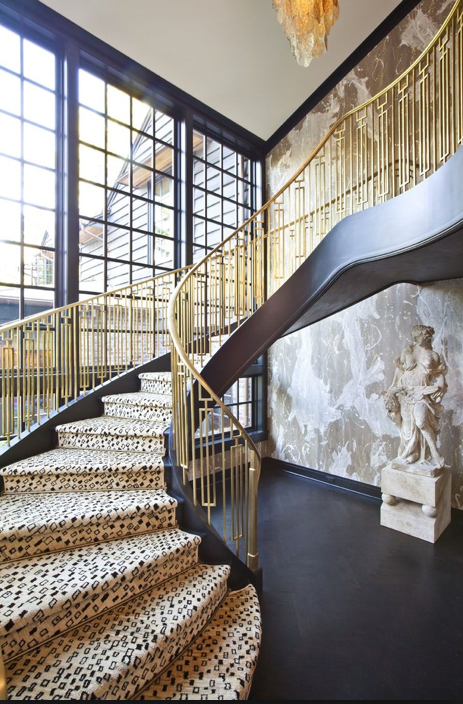 Even if you don’t want to go as bold as these imagesÂ statement stairs are the way to enliven hallways I reckon!